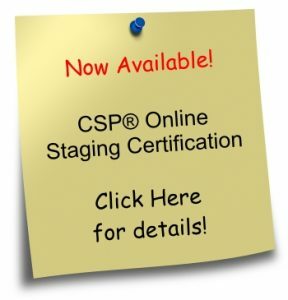 In 2005, when CSP International™ Staging Business Training Academy launched a unique continuing education model for getting certified in an industry that had no guidelines, no trade association and no professional standards, it established a precedent for excellence by establishing examinations, code of professional ethics and a continuing education platform. CSP International™ and continually demonstrates leadership within the industry. Since then, CSP International™ has continued to lead the way with comprehensive resources, negotiating savings for proven business-building tools stagers can use right away plus an online Business Resource Centre to support graduates with real-world expertise and solutions after class. CSP International™ is the award winning, undisputed staging industry leader for training, education and certification. 3) Tools and resources to support your growing business, AND 4) on-going staging community support, job shadowing opportunities, coaching and mentoring after class to ensure the success you dream of. Earning your CSP® designation provides visual proof of technical competence, while providing an opportunity to be in business for yourself – without being by yourself. 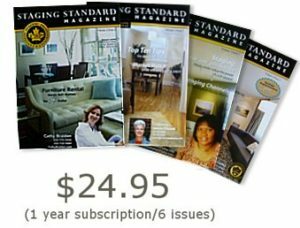 The CSP® Staging Training business model is based on personal direct sales and operates as a home-based business – without the need for retail space. You can work from home, making it easy and cost-effective to get started, expanding into warehouse / office space when that makes sense for your business. 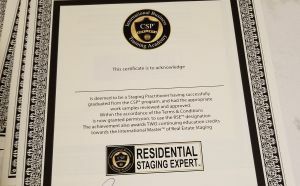 Why Become a Certified Staging Professional®? Applying in a real-world, practical way what is learned in the classroom is one of the hallmarks of CSP® training. On day three of the intensive CSP® staging training program, participants stage an actual property currently on the market as part of their curriculum. In addition, before and after photos of the rooms they stage can be used to start their own portfolios. 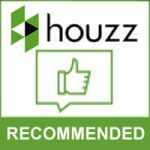 All instructors are Certified Staging Professionals graduates, as well as owning and operating successful staging businesses; what that means to you is they bring their experience and talent to the classroom, and you learn from the best. In addition to the staging skills curriculum and practical experience, an optional add on to the learning is opt in for the marketing and business-building tools and support of the Fast Track Business tools. On top of the theory and practical information, Fast Track participants receive additional tools / software programs and coaching designed specifically to support staging businesses for fast start-up and easy on-going systems. CSP International™ knows that your training does not end when you leave the intensive classroom experience; in fact, it’s just beginning. So, once you leave the classroom, whether you take the Standard Foundation, or the Fast Track add on option, you have a variety of resources available to you. Everything from an online Business Resource Centre, packed with marketing materials, tools and tips, to an online community forum where you can get your questions answered. You also have access to the Marketing Advantage Program™ to MAP your way to staging business success. These are eight on line work at your own pace modules to get your business started, includes guide for social media, business licensing and other practical aspects of startup. There is a variety of practical and relevant bonus materials to help you get your business up and running as you apply what you’ve learned in the training. And you’ll also learn about other skill upgrading opportunities to take advantage of when you’re ready. The concept is simple: you have support to secure clients, establishing your business brand in your local marketplace as a Certified Staging Professional® as quickly as possible. 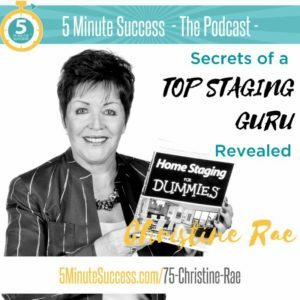 If you’re still not sure and would like to learn more – register for this complimentary webinar below where Christine Rae shares with you everything you wanted to know about having a staging business.